Ralf Kesper (Fröndenberg, Germany) on 18 January 2019 in Documentary & Street. Looks like it is snowing, he is not going to be very warm. "Chance !!!!!!!!!! 200 000 000 euros for you waiting at your favourite Gaming Shop" !!!!! Run,Mister,Run !!!!!!! A powerful portrait of the seller on this winter day. Brrr biking in the snow, very cold! You feel the tension in the photo. The man seems very intent on his reading, disregarding the cold and snow. What he reads must be important. It's a little bit difficult for me to understand what the title means. Just a cigarette and then on. I like the B&W. It adds to the cold feeling. A curious story captured. ja, er sieht zufrieden aus! Ein interesssantes Foto. He is pausing before continuing on his bike. A cool looking scene. A superb portrait with beautiful composition and B&W ! Intriguing image. Makes one wonder what is going on! He won the lottery or maybe his bicycle. A cool capture of whatever he's doing. @Steve Rice: He's just a poor collector of returnable bottles. For one back giving bottle 25ct. Because the pensions are very low in Germany today. Ironically at this plastic bags is something written about "winnings" of a supermarket. Means, everybody who buys there is a winner. This picture is a social critics about our politics here. 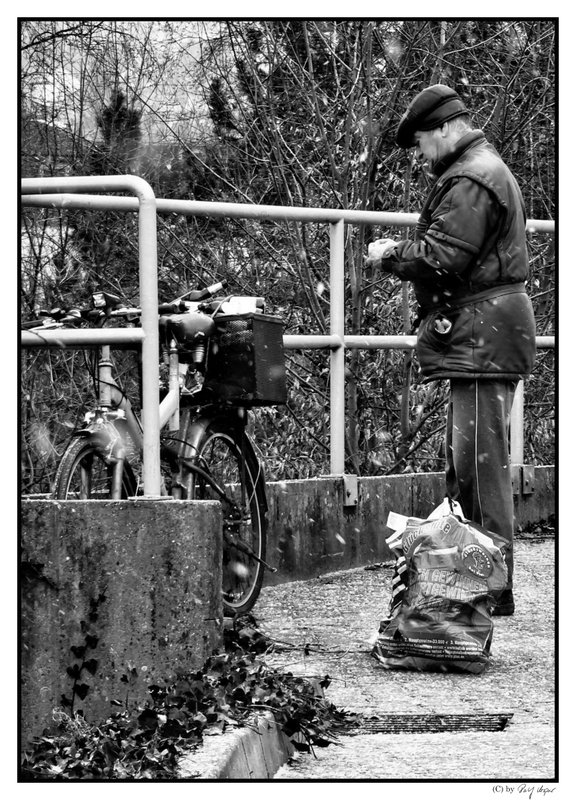 But his collecting was a bit succesful with two bottle filled bags and a lot more at his bicycle. Truely a "winner" at this day. Earned enough for beer and cigarettes, I think. A great scene. But it must be hard to be collecting bottles in the snow and cold. That is a very sad commentary on how things are today in this world. I really like the use of monochrome and the view of the bike. @Elaine Hancock: Yes, it is. Germany is one of the richest countrys in the world. But a lot of people are rather poor here today. Really sad reality. Thank you for your comment. Interesting shot and information about the bottle collector. Beautiful street scene under the snow. Thank you for the explanations that set the context for your humanist photo. I like your documentary photo, hope he feels like a winner.